This device, the Rocketfish model RF-WSMNT, holder is great because of it’s solid construction. It works well with most cell phones and smaller GPSs. 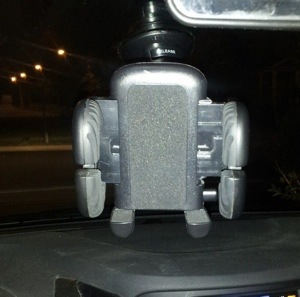 This holder uses a suction mount on the windshield. The suction is very stable and reliable. Compared to previously used device holders it is much better overall, especially in terms of durability. However, it is not as easy to slip my phone in, the goose neck is not quite as stiff an therefore bounces around a little more on rough roads. It’s not too hard to mount but could be difficult if finger strength is an issue for you. It doesn’t work so well with my GPS because there is a mounting bracket at the back which prevents it from being held in place properly. If I don’t need a charge then I can remove the bracket and it fits in just fine. Since my GPS’s charge port is at the back the brackets are not deep enough to properly hold the GPS plus charger mount. Mine was purchased at $26.99 for an open box item from Future Shop. The regular price at $29.99 is still an O.K. price. At around $25 I felt this was good deal. Though more expensive than the typically cheap holder it compares well to other similar models I have seen. The quality on this is outstanding. The mechanism feels solid for holding and releasing your device. The rubber hold the device in place is secure. Since the rubber is strong I could adjust to stay away from side buttons. The trade off of the rubber is that it means you can’t just slide it in. Very durable over the past 5 months and I haven’t noticed any issues. I would easily recommend this for quality more than price. The secure suction can be a negative if you don’t have good finger strength and don’t need to remove it frequently.